HOW to Send Stock Directly from China to Amazon Fulfilment Centres! HOW to Send Stock Directly from China to Amazon Fulfilment Centres (FBA)! 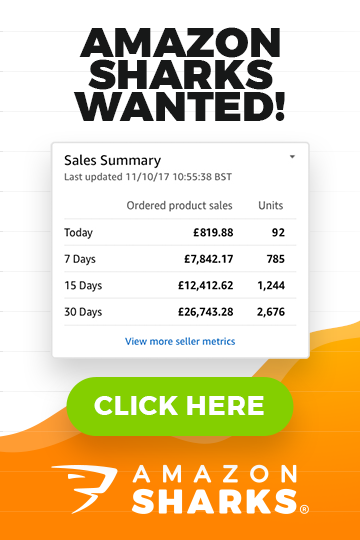 Amazon’s FBA program is becoming more and more popular with marketplace sellers, and that’s really no surprise – it’s a big sales boost and also removes a lot of the work of selling online! It allows you to concentrate on what really matters – branding, promoting, sales, sourcing etc. while outsourcing all the tedious fulfilment tasks such as packing products, printing labels, posting items, processing returns etc. Now the “normal” way to get set up with FBA is to package and label all your stock and send it to Amazon yourself, who will receive and sort it, but I get a lot of emails from people looking to get started with FBA who want to have their stock sent DIRECTLY from China to Amazon, without them ever having to see or handle their stock. Now you may be wondering why, because surely that’s risky… and while that is true – if you can manage to arrange it like this, you save money on shipping and also save a lot of time and hassle for yourself. And that’s exactly what today’s post is all about – sending stock directly from China to Amazon’s fulfilment centers in the UK! Judging from a lot of the emails I get, many people seem to think this is as easy as simply putting the Amazon fulfilment center address instead of your own home/business address but unfortunately this is NOT the case… there are a lot of things you need to be aware of when sending stock directly to Amazon and you’ll need to use a freight forwarder to help you take care of all of the details (Woodland Global is the company I recommend for this). What this basically means is that you need to arrange a freight forwarder for your shipment, so that they can clear your delivery through customs and then arrange the domestic shipping to Amazon. This is all fairly obvious, as if you simply posted items directly to Amazon from overseas, they’d be responsible for customers clearance and any import charges, which is of course not something they’re willing to do. So that takes care of the shipping, customs clearance and ensuring your products make it to Amazon’s fulfilment centre… but there’s still a LOT more to do. You have to make sure that the products you send to Amazon are packaged and labelled as they require them, otherwise your shipment may be rejected or you’ll be charged excessive preparation fees. There are countless horror stories online of sellers who have faced huge delays and costs over small errors with the products/packaging sent to Amazon, so please take this seriously and make sure you get it right. 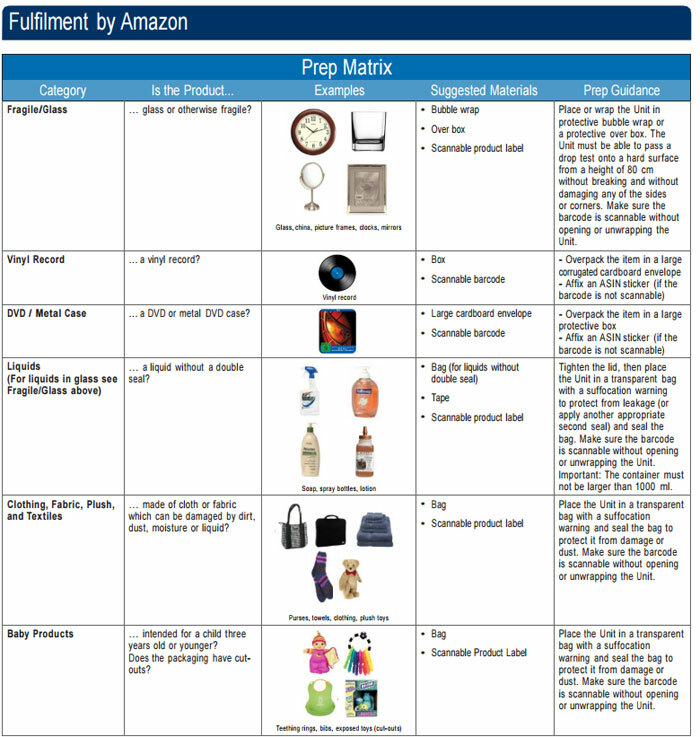 I’m going to quickly run through the process for sending goods to Amazon, so that you have a step by step guide to refer to if needed. 1) Create a Shipping Plan – select which products you’re sending to Amazon, set the ship-from address and choose which packing type your products will be sent as (either individual products or case-packed products). 2) Set the quantity of units for each product you’re sending and click continue. 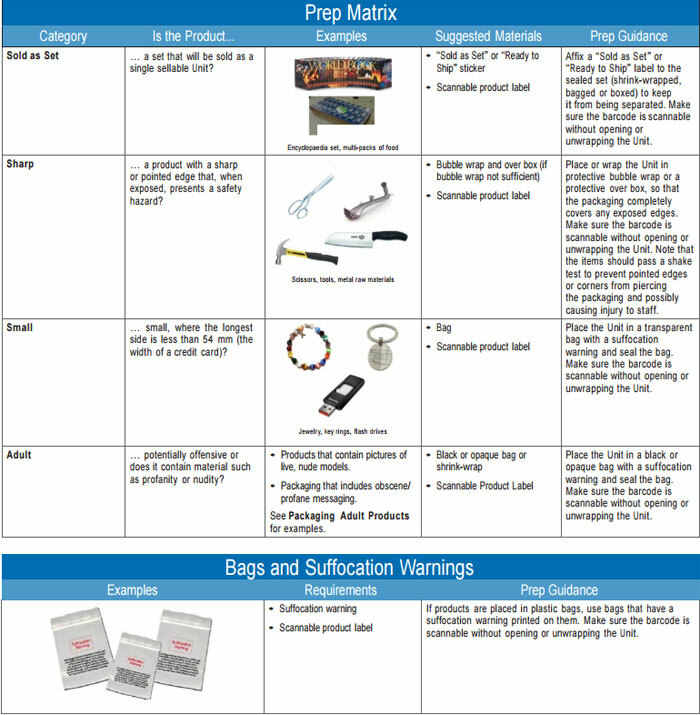 3) Prepare products for shipment. “Any FNSKU used by the seller must correspond to one unique product.” FNSKU stands for Fulfilment Network Stock Keeping Unit and it’s basically the label Amazon uses for FBA items. You can print labels from the Label Products page by entering the desired label quantity in the “number of labels to print” column for each product in your Shipping Plan and selecting the “Print labels for this page” button. You can print labels from the Manage Inventory page by choosing your products and selecting Print Item Labels from the “Actions” drop-down menu. If you have a barcode scanner, you can use “FBA Scan & Label” feature to create labels for your products. 5) Preview your shipment – this is basically where you review and approve the final shipment plan. After that you’ll be given info on where to ship your products (i.e. to which fulfilment center). 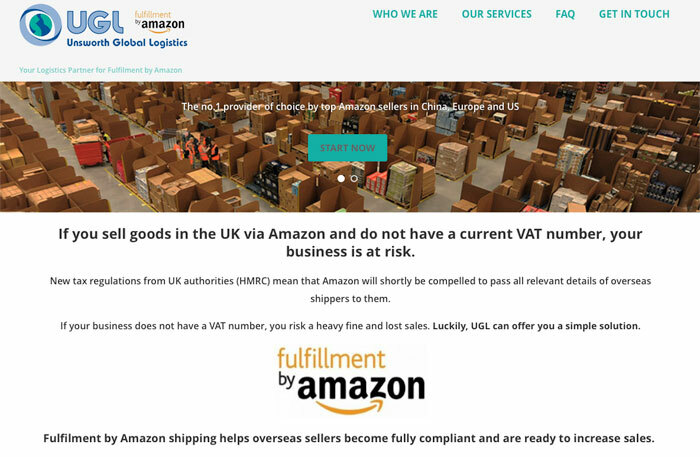 *Important, once you approve your shipment any listings that are currently fulfilled by the merchant will be changed to fulfilled by Amazon and this means that they’ll become inactive on Amazon.co.uk and you will not be able to fulfil orders directly. Only once your shipment is received at the fulfilment center and Amazon start fulfilling orders for you, will the listings become active again. The final preparation differs depending on whether your shipment is a small parcel delivery (SPD) or less than truckload delivery (LTL). 1. Select the Shipping Method (SPD or LTL) and the carrier. 2. Enter the number of boxes you are shipping and print shipment labels. Print the full set of labels. Each label is unique: do not photocopy, reuse, or modify labels for use on additional boxes. If you wish to modify the number of boxes after you have already printed your labels, you will need to reprint the entire set of labels for your shipment. Indicate the number of box labels you will need (one per box) and print them. Place each label on the outside of each box, so they will be visible when unpacking the pallet at the fulfilment centre. 3. Enter information regarding your shipment based on the type of shipment and the carrier. If the box weight is between 15kg and 30kg, you will be alerted that you need to print and affix ‘Heavy Package’ labels on four sides of the box. If the box weight is more than 30kg, you will be blocked from completing the shipment. Cartons weighing more than 30kg must be broken down into smaller shipment weights. 4. Enter the number of shipment labels you need and print them to affix to each box. Small Parcel Delivery (SPD) shipments require one label per box. Visit FBA Small Parcel Delivery Requirements for more information. LTL shipments require four labels per pallet. And there you go – your products are now ready to ship to Amazon! I hope you now see what I meant when I said it is not that simple a process! It goes without saying that you need to be very confident that your supplier is going to prepare and label your products as required, otherwise this whole process is a waste of time and will cost you a lot of money at the end of the day. Overall there are a lot of risk with sending items directly to Amazon, rather than receiving, inspecting and preparing them yourself. Personally I don’t like the idea of items being sent to my customers without me ever actually seeing them myself… but it all depends on you and how much money you save by sending directly to Amazon. However, if you do decide to go down this route then I strongly recommend you get a pre-shipment inspection done in China. In fact I would say that this is a 100% necessity as it means your products can be inspected (quality control) and you can also get the inspector to ensure that they meet Amazon’s packaging and labelling requirements, to avoid any nasty and costly surprises later on. If you don’t know what a pre-shipment inspection is or how to arrange one, please take a look at this post on my blog, which goes over everything you need to know: Pre-Shipment Inspections in China – STAY SAFE. However, if you’re still not confident enough to send items directly to Amazon using a pre-shipment inspection but you still do want to arrange it somehow, then you’re in luck, as there’s a sort of middle ground option – shipping companies that specialise in sending stock to FBA! That’s right, there are now logistics companies out there who offer a dedicated service for shipping stock to Amazon’s fulfilment centers in the UK. 1. You send your order to them in the UK/they arrange collection of your goods from China and arrange delivery to the UK. 2. They take care of the customs, import procedure etc. and collect your shipment from a UK port and forward it to their address/warehouse. 3. They inspect your items, sort the shipment and make it Fulfilment by Amazon ready! Labelling and packaging all individual items correctly. Sorting all goods according to Amazon’s specification. Loading your items into the standard pallet that Amazon uses for incoming FBA deliveries. 4. They arrange delivery of your shipment to the designated Amazon UK fulfilment center. It’s as easy as that! To put it in very simple terms – they basically offer the prep service that Amazon themselves offer, but at much more practical and viable rates! Konnexus – Konnexus offer a few different services, including a full product inspection and prep as well as a simple forwarding service, which consists of re-labelling and shipping to Amazon’s fulfilment centers. They also offer services for returned FBA shipments, but if you’re reading this guide then you hopefully won’t need that! 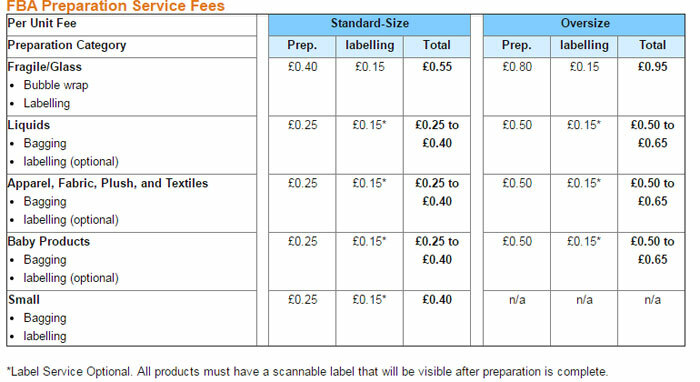 Inspect, FNSKU Labelling only – £0.49 per item. Inspect, FNSKU Labelling, Poly Bagging and Price sticker removal – £0.75 per item. Inspect, FNSKU labelling, bubble wrap, shrink wrap, bundling and multi-packs – £1.00 per item, bundle or multi-pack. 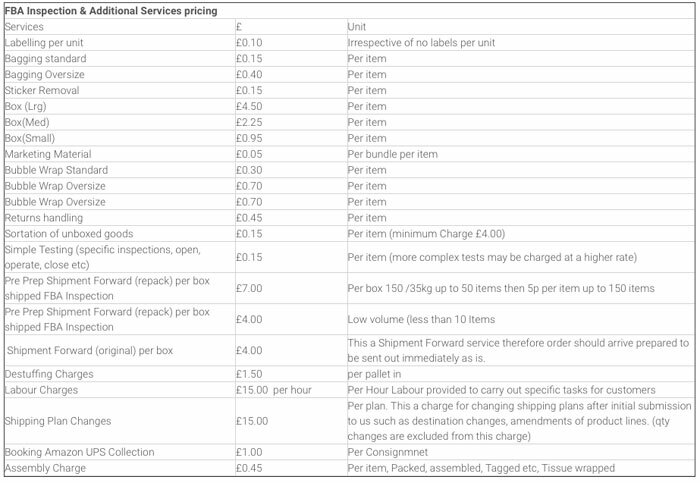 As you can see the price ranges from £0.49 per item to £1 per item, depending on which level of service you need. And last but not least, our tried and trusted Woodland Global also offer a specific service for shipments to Fulfilment by Amazon. Their pricing differs depending on each particular, so please get in touch with them for more info. Now I know I’m going to get a lot of messages asking me whether it’s worthwhile or not using one of these services and let me tell you now what my answer will be – I DON’T KNOW. It’s simply impossible for me to answer that question as it depends on so many factors. For example, how much is this going to cost you? You have to compare the fees for this service vs using Amazon’s preparation service vs arranging it all in China via your supplier and inspection services vs doing it all yourself! You have to consider how confident you are in your supplier to do everything correctly and make sure you don’t get fined by Amazon! I hope you get the point here! It’s impossible for me to say as it really does depend on your individual circumstances and situation. But I will say that these companies are a good alternative to have – providing a middle ground between the two other options in terms of cost and difficulty. And that pretty much brings us to the end of today’s post. This is quite a boring and lengthy topic – all about packaging and labelling but it’s something you simply have to get right! As always, if you have any questions or comments then please leave them below this post and I’ll personally get back to you within 24 hours, Monday to Friday. This way supplier can still fix any issues with the order/products BEFORE they leave China. I am in the process of creating a board game. I am getting the game manufactured in China. I wish to sell the game globally. 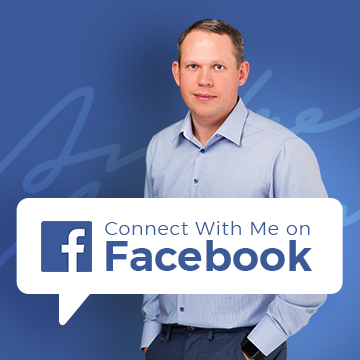 I am based in Australia. The manufacturer does not drop ship. I am looking for the cheapest method of shipping 2000 units to customers individually. Shipping from Australia is about AUD$45.00 using Australia post plus the cost of shipping the game TO Australia which is more than what I want to sell the game for. Using a company like “BoxC” ..they charge about USD$ 16.00 to ship. ANy way to get cheaper shipping? Thank you. You basically need to find as many fulfilment companies as possible and get quotes from all of them. You should also know where your biggest market/customer base is and use that country as your base/main fulfilment centre – at least one to begin with. Then you can later on expand and add more regional fulfilment houses too. I can’t give you any specific recommendations though. Hi Andrew. Thanks for this post – it’s very timely! How do you determine the shipping Method (SPD or LTL) when preparing the shipment? I have an order of 20 cases weighing 8kg each. It depends on how you’ll send them to Amazon – will you use a pallet service? If so, you would format it as LTL shipment which will have labels for the whole pallet and for each box on the pallet. If you will send each box as separate shipment via courier, then you’ll use SPD method. Thanks for your reply Andrew. well I would intend to use WG for FOB ocean freight from China port to UK (direct to fulfillment centre) I’ve compared costs between ocean, air freght and express courier and ocean is most viable, so would ocean freight need to be palletized by default, and would it be WG palletizing the cases, or the supplier at the port?